A newer trend seen in some municipalities is the process of leasing fleet vehicles as opposed to purchasing them. Cities decide to lease for a variety of reasons. For the city of Rockford, Ill., its leasing initiative was born from necessity. As the city “went through a major budget cost reduction initiative,” according to Carrie Hagerty, financial director, outside consultants were brought in to see where money could be saved. One of the first things the consultants noticed was the size of Rockford’s fleet and the maintenance costs associated with it. “We ended up having a replacement vehicle for every front-line vehicle because the front-line vehicles were unreliable,” Hagerty explained. Since its replacement needs were so substantial, the council approved a four-year leasing initiative to begin replacing fleet vehicles. In the first year, fleet replacement costs totaled over $10 million. “It allowed us to actually start replacing vehicles,” Hagerty stated. 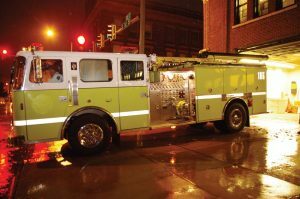 They replaced fire trucks; squad car; ambulances; heavy equipment such as snowplows; sedans; and trucks. 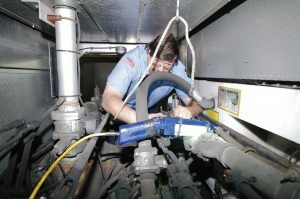 Anything that is maintained by the city’s garage is purchased through its leasing plan. A byproduct of this was a large increase in employee morale. “We are giving employees the appropriate tools they need to get their job done,” she commented. Employees are happier knowing they have safe, reliable, modern equipment to work with. Due to budget constraints, the leasing program was discontinued for a few years; however, city officials feared they would again end up with a large fleet of unreliable vehicles.There were a few 2003 and 2008 vehicles with significant mileage, for example, that had not been replaced in the first wave of leasing. This led the city council to approve a continuation of Rockford’s leasing replacement plan in 2018. Leasing contracts were awarded on a competitive basis so the city was consistently getting the best interest rate; however, this led to different leases being held at different banks. The city has since chosen to have a master lease agreement through only one bank, PNC Bank. Th e master lease agreement also allows the city to lease vehicles without having a public notice each time. Since this was still a new approach to fleet replacement, Hagerty commented, “It felt like we were blazing a trail with this.” Not having the benefits of learning from another city, the city of Rockford had to come together to “make sure all the balls stay in the air.” This meant working with various departments, banks and sellers as it figured out the best processes as it went. Hagerty recommended having a good process planned out, proper approval, proper documents, a system set up for payments and a plan for vehicle procurement. Titling vehicles properly was also a surprisingly difficult process and the city is just now “getting the process start to finish locked down.” She urged municipalities that are considering this route to reach out to other communities for tips and advice. 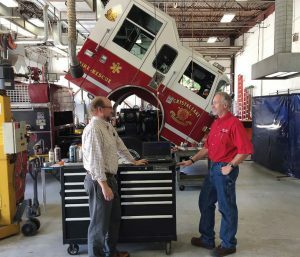 When it came to reworking the way Crystal Lake, Ill., replaced its municipal fleet vehicles, the town did its research to determine the best and most cost-effective method. George Koczwara, Crystal Lake’s financial director, discussed the research and preparation that went into the city’s decision to lease its fleet vehicles. The method the city was using, which Koczwara now calls “capital triage,” was becoming ineffective. 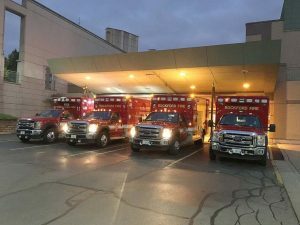 “Capital triage wasn’t working and maintenance costs were going through the roof and vehicles weren’t available when we needed them,” he explained. Research led to the proposition of leasing fleet vehicles. 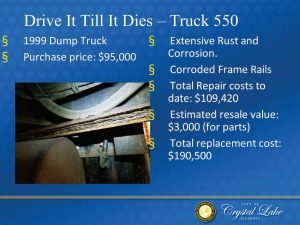 The city council proposal explains, “The city currently has a fleet of vehicles of varying ages, many beyond their useful lives and capabilities, which has caused staff to reexamine our procurement practices and consider the benefits of fleet leasing.” As financial director, Koczwara also stressed the importance of a lifecycle cost analysis method for vehicle replacement. As a member of The Interlocal Puchasing System, Crystal Lake was able to enter a fleet leasing and management contract with Enterprise Fleet Management Inc. more easily than it would have been able to otherwise. Since Enterprise was awarded a contract by TIPS following a competitive proposal process in July 2016, Crystal Lake was able to save both time and money. Maintenance costs will be reduced since the city will follow an optimal vehicle replacement schedule. With 54 out of the 116 vehicles to be replaced having bumper to bumper coverage, repair costs will also decrease. 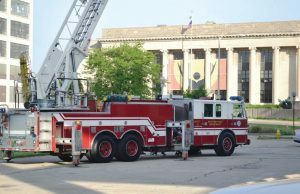 Koczwara described how the city would also be able to utilize a computerized information management system that would monitor and document preventative maintenance and repairs for fleet vehicles. Partnering with Enterprise, the city receives increased fleet management support, which includes more buying power; fleet maintenance reminders and recommendations; assistance with insurance claims and repair; and assistance with routine administrative tasks such as license renewals. Once the vehicle’s lease is up, Enterprise sends the vehicle to auction and the city takes the depreciation risk. Residual money from the vehicle’s sale at auction then goes toward the city’s next lease. The majority of fleet vehicle leases are for five years except for police pursuit vehicles, which are three-year leases. Koczwara also explained that the city has the option to renew its leasing program for an additional five years. Ambulances and fire trucks are not currently included in its leasing. There is only one current challenge that Koczwara and Crystal Lake face and that is the wait time, specifically for vehicles that need outfitting. “A challenge is the delay on dump truck orders,” he admitted, which is something the city crucially needs. A number of companies provide fleet leasing solutions to cities, including Donlen, Enterprise, ARI, GE Capital and Lease Plan.